Indian Khana, Made Easy: A Plateful of Happiness! Sometimes it's worth driving an hour or more for your favorite snack. This past weekend, we drove down to Moghul Express, and gave into our cravings of popular Indian street food. These are but not limited to pani puri, bhel puri, aloo papdi chaat, aloo tikki chaat, and samosa chaat. 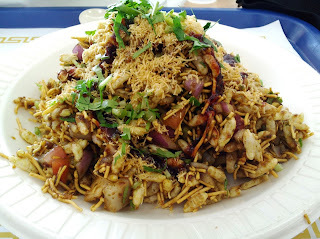 Our favorite is bhel puri and boy, was it satisfying. The portion size was good enough for two but one can eat it devour as well. I'm glad my mom ordered her own because I finished mine pretty quickly. How shall I describe this snack? 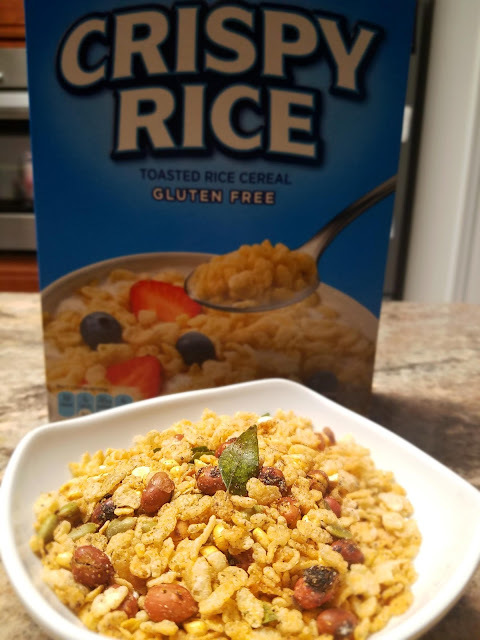 There were crispy, sweet, sour, and spicy elements in it that meshed so well together. It wasn't deep fried and was made with healthy and fresh ingredients. After we got our fill, we took a drive through Edison for a bit of shopping. Holi just passed and Ugadi is just around the corner, so we wanted to load up on some savory and sweet treats to celebrate. We stopped at Sukhadia's and bought dry fruit kachoris, masala peas and rasgulla sandwiches. The sweet sandwiches never had a chance; finished them within days. One thing is for sure, we can't keep driving down to Edison for all our cravings so it's a good idea to make them at home from time to time. So it's good that we know a couple to enjoy at home: aloo papdi chaat or aloo tikki chaat. Visit WanderFood Wednesdays, for more food adventures and delights. That looks delicious! Different than what I had at the Diwali party, but I really want to try making this. YUM!! !